I know I’ve been slow with the real schittery lately… I think I’m getting to that point where I’m just bored with it all and ready to move on to something else. This always happens to me and is the reason why I don’t get a lot of projects finished. Well, it’s been almost a full year of THAT REAL SCHITT, so I’m gonna try to keep it going at least until the 1st anniversary. Maybe I’ll go wild and drop a bunch of my secret weapon exclusive joints as a going away present to you all… well, don’t hold me to that, I’m just rambling right now. Who knows, I may keep posting on this blog for the next ten years (don’t count on that, but I guess we won’t count anything out either). This time around we’re going back to the old school- I think this is like the first time since I dropped that holiday real schittload of live old school mp3s, isn’t it? This is another one that I believe has already been making the rounds all over the internet blogosphere, but if you haven’t copped already you need to scoop it up and add it to your collection now, because it’s a classic. This is part of the infamous battle between the L-Brothers and Kool Herc & The Herculoids from way way back in the prehistoric days of Hip Hop, 1978. Or, as I like to call it, 1 B.S.H. (meaning one year before Sugar Hill). 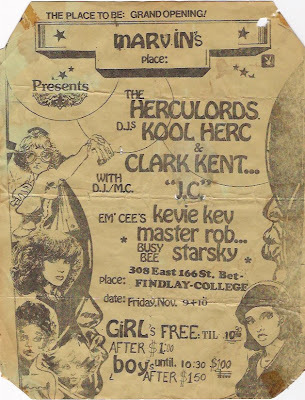 The L-Brothers line up consisted of DJ’s Cordio, Mean Gene and boy wonder Theodore, and MC’s Kevie Kev, Robby Rob (later known as Master Rob) and Busy Bee Starsky. What’s really ill about this battle is that you have a young Kev, who couldn’t have been much more than 14 or 15 at the time, talking much schitt at Herc, who was the established king since the early 70’s, and his crew. I mean serious disrespect going on here, and this was like 3 or 4 years before Kool Moe Dee took it to Busy! Keep in mind this is 1978, so it’s not like you’re gonna hear the crews spittin’ rhymes directed at each other… it wasn’t done that way back then. Regardless, this is a great piece of lost history right here that is a must-have for anybody who really cares about said history. The sound’s a little distorted, but who cares… you can’t really expect a tape this old to sound but so great. Highlights, other than Kev’s schitt talking: Starski getting loose over a “Fruit Song” / Truck Turner beat mix and young lady emcee Smiley letting all the partygoers know that she’s a “jazzy muthaf**ka”. There also some Fantastic Romantic 5 stuff stuck at the end of this clip, probably from around 1981 or so. This entry was posted in old school rap, old school rap live. Bookmark the permalink. Nothing better than a little old school to get the mood right for Springtime. Thanks again for you knowledge and history. This is nuts. Thanks for posting Phill! As always, over 100 some downloads and no love from anyone else. Phil IS that archeologist! Respect.Tip of the hat for bringin in the spring with some of that classic feel good warm weather schitt. …Recording to the Maxell as we speak. Phil, your a piece of this Hip Hop puzzle. You can’t leave us out here. We need realness and masters like you. Its teachers like you that remind us of what good music is all about. It’s like those marvel comics…except we’re figthing against “WACKNESS!” Don’t worry about tommorrow. As long as your doing what you enjoy, you will always be rich. We got your back what ever you decide to do. Love, Live and Learn. California Love. -Bird. This is the REAL Hip Hop music I am into! Thanks man. Yessir.Hold the line, ol’ boy.Kids nowadays are STOOPID.Guaranteed. Phil, just wanted to drop a note of thanks for all the knowledge and perspective you’ve dropped over the years. I’ve never met you but I’ve followed (off and on) your words since the rap sheet/crates-list/worldofbeats days. Following the sentiment of previous comments, I encourage you to keep up the great work. (and I know it’s WORK sometimes…but things of importance and great impact usually are). hey umberto… thanks for the links but… let’s not do that here. that’s a little bit TOO much at one time IMO. but it’s nice to see that all that old school history is out there and available for whoever wants to partake of that truly real schitt (the REALEST real schitt imaginable). oh, any by the way… just so you know, for any who may think that my talking about not doing this anymore has anything to do with a perceived lack of interest, that couldn’t be further from the truth. i don’t really check how much traffic other blogs get, but i’ve been more than satisfied with the amount of visits and feedback i’ve been getting here at THAT REAL SCHITT. i mean, i’m very realistic about this- it’s 2008 and the kids are into Lil Wayne and Soulja Boy and whoever else is poppin’ on the radio these days (I don’t even know who the hot rap dude of the moment is, i’m that far removed from it all at this point). We’re not gonna bring back 1987 and make THAT REAL SCHITT the hottest thing on the streets or the internet- it just ain’t gonna happen. This blog is not gonna get that level of interest. But there are still plenty of people like myself and like everybody who’s reading this who are either nostalgic and miss the original days of Hip Hop or who are just interested in knowing more about the history. Plus, I have a lot of my own works that I’ve done over the years that have gone under the radar or were just never released to the public, so I want to get that stuff out before I croak for whoever may be interested. And as I have learned in recent years with the interest in some of my random rap stuff from the 80’s, there is a good amount of people out there who are indeed interested in that stuff. So that’s what it is- Hip Hop originally started out as an under-under-underground culture that only a relative handful of “real heads” even knew existed and that was the era in which I was first introduced to it, so I’m real cool with carrying on that tradition. We don’t need mass appeal hear at THAT REAL SCHITT, just so long as the ones who do come through are “true to the game”, and from all the feedback I get I have no doubt that that definitely is the case.so to be clear, if the THAT REAL SCHITT posts stop it’ll probably be because i’m just tired or bored with it more than anything else. i’m getting older (ain’t we all?) and i enjoy chillin’ and doing absolutely NOTHING more than ever before. check my earlier posts, i said it before- if this schitt becomes too much like work i just ain’t gonna do it no more. so we’ll see how it plays out. the fact that i had a lot of future posts all set up and lost everything when my ext hd crashed definitely is making it harder for me to update the site in a timely manner (only 3 posts in april). plus you have all those other people who got the idea to just flood the internet with mp3s of old school live tapes- i’m not mad about that, it’s great that the history is being put out there and people are finally interested in that stuff. but it did cut into what i’ve been doing here on this blog to some degree… that’s how it goes. so like i said, we’ll see where we go from here. PEACE. I’m not nostalgic. I’m scientific.As for Lil Silly,all he’s doing is stacking up Federal charges and he will soon be outta here. They got him.They got Michael Jackson, didn’t they? how about a mp3 of the mad money ebay joints? How about a parasitic mini-blog?You could post a complete rip just before you ship it to the ultimate bidder.